The ‘virtual company model’ had been used as pedagogical concept in the OpenInn project that was one of the former projects of SP4CE project. In the following section the method will be described in details to help the teachers (called mentors in SP4CE project) in their mentoring partly based on the material of OpenInn. The main goal of the innovative didactic method ‘virtual company pedagogical model’ is to create a strong intrinsic motivation in the learners, students. The stronger motivation creates stronger commitment of the learners, students. The first step is to set the basic rules and values in the group, and also to agree on them with the students. Each student is asked to give her/his definition for every point of the list below and share it with his/her groupmates in the document called ‘Values Document’. This document can be in the form of a Google Docs or any other shared document. If discussion is needed to clarify part(s) of it, it can be done in the same Values Document or by using Skype or Google Talk or during a personal meeting; or any other form that fits to the group. The document with a short description of each point can be published on a blog and will mark as the common framework for cooperation. When the Values Document is shared and validated, the group becomes a team. When the brainwriting section is done, the results shall be reviewed, discussed and agreed. The teacher/mentor will guide the team through questions to an agreement on the Common Goal. 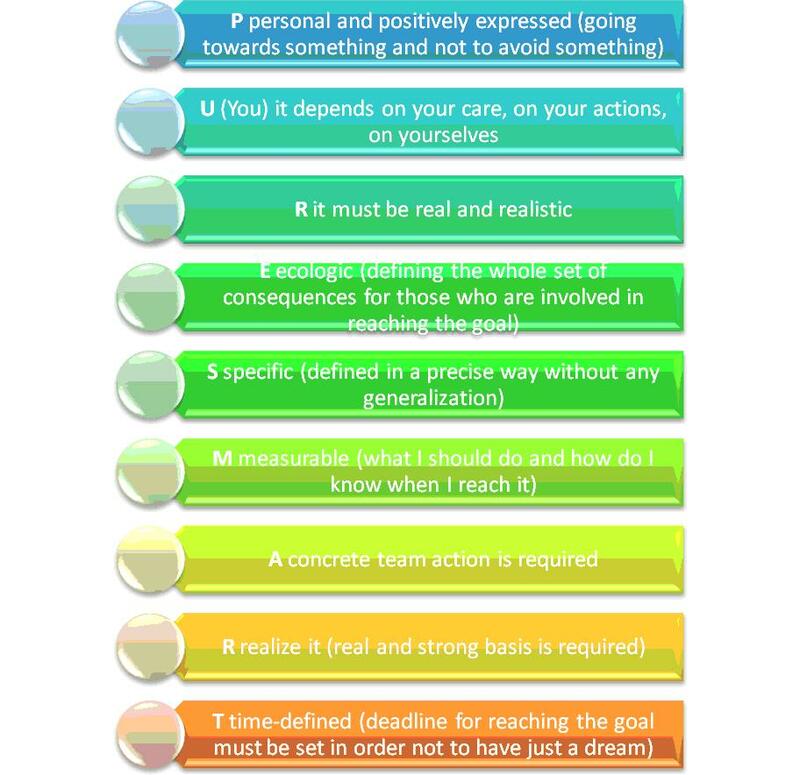 The Common Goal shall be summarised in 1 or 2 sentences. When the Common Goal is set, the team builds up a list with points where “positive things” are defined, this list can be written on Google Docs. The team shall make a review of existing resources of the team: skills, knowledge, experiences, contacts, special backgrounds, sources of information, etc. – anything, that can be useful in the discussions. This “resource list” can serve as help in the later process, especially in cases of getting stuck. This phase is focused on the very positive aspects to create a good feeling that will help building up the next phase. 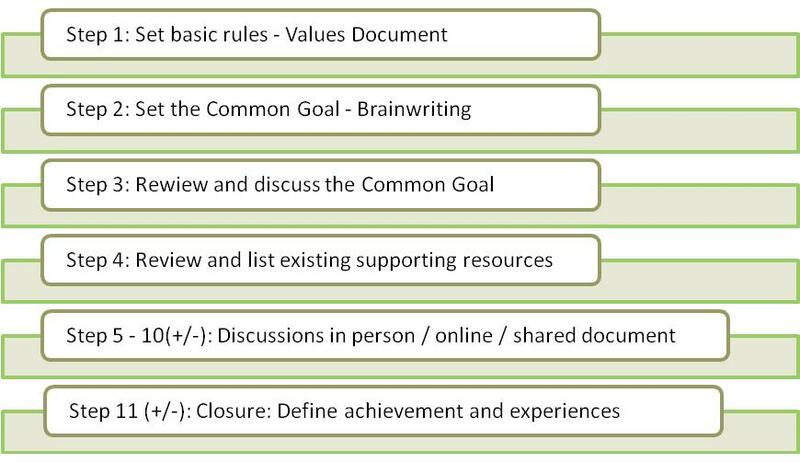 Having the ‘Values’, ‘Common Goal’ and ‘Resource List’ it is time for the discussions section. These meetings for the team could be in person in (class) rooms or through Skype or Google Hangout programs. In the meetings students can share, check, test, support, develop their ideas and they are supported by the teacher/mentor in this work. Virtual meetings are also possible, e.g. for team members who need to check the status of teamwork at home. During these meetings the team itself can identify what working method they want to follow, for example they can work simultaneously on the same shared document of Google Docs. How many discussions do a team need? It is totally up to the team and their resources. Maybe 3 discussions are enough or maybe more than 6 meetings/discussions are needed. 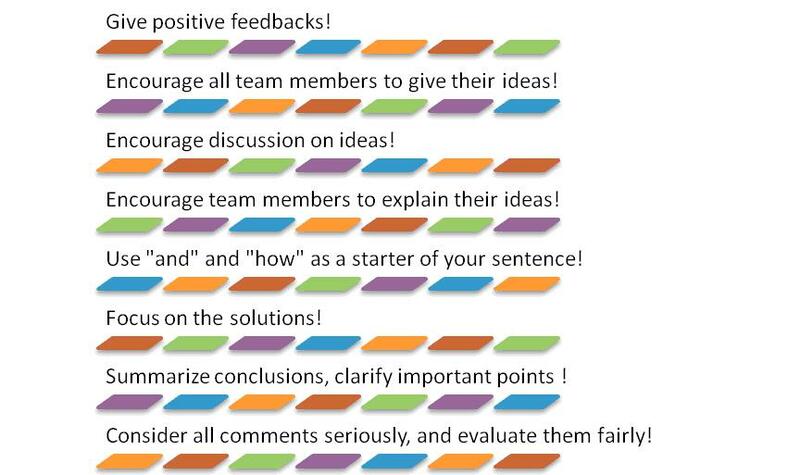 What is important in the row of discussions is to have a closing discussion – this is described in the next step. what are the main experiences? what about the Common Goal? follow up of the project. In SP4CE project the teacher helping the students is called ‘mentor’. This role of the teacher /mentor is different from the classical teacher role, in this process the teacher is guiding the team through a series of processes to define and reach a common goal. This common goal is defined by the team itself in the early stage of the course, later on the teacher supports the whole process that will guide the team to the goal. 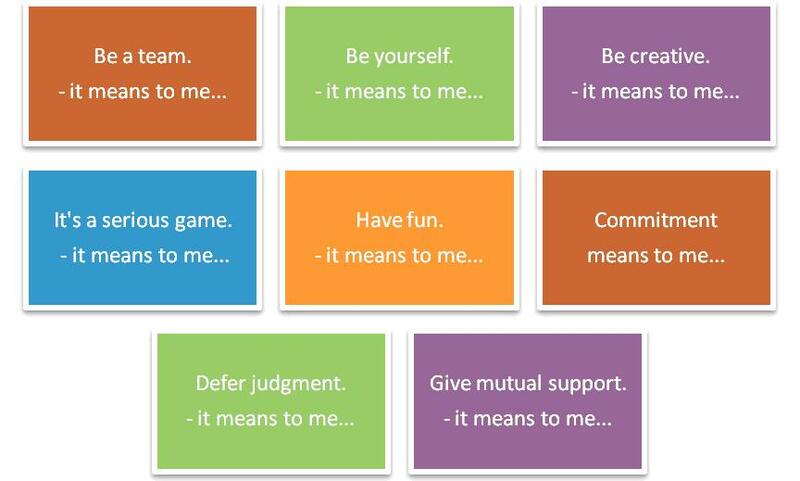 The teacher /mentor will guide the students/learners in choosing their roles and promoting mutual support among the learners. The roles in the student team are based on personal vocation and ambition of each student in the team. In this approach the teacher is rather a facilitator to the group/team than a traditional teacher. The team’s creative and innovative ideas will help to find solutions for the problems raised by the company in question. Therefore the teacher should be only a supportive “catalyser” and group moderator and not the leader of the group. Trainer, facilitator, advisor, and mentor – these roles should be in the foreground when dealing with the team. What a group facilitator should do / say? What a group facilitator should NOT to do / say? Here is the list of “not to do”-s, also short and basic. The main idea is to limit negative comments and behaviours in the team and also from the side of the mentor/teacher. 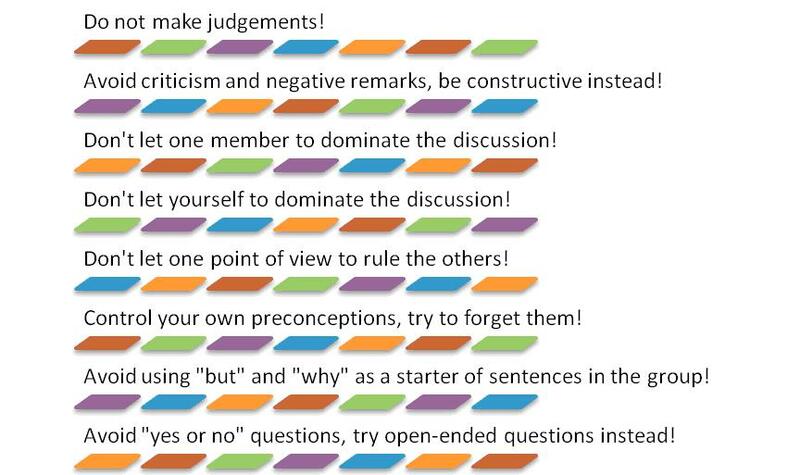 ‘No’-s and ‘but’-s and negative critics do not allow the solutions to be developed, therefore please try to eliminate those in the team (and also from the teacher’s side). Also “why” is rather focusing on the reasons and not that much on the solution, so please also try to avoid questions starting with “why”. (For more details please check the websites offered in previous footnote.) Good luck!